It wasn't until I joined the sewing bloggers fraternity that I realised that it is perfectly normal behaviour to be a fabric stroker. I can spend my whole lunch hour stroking divine fabrics - I suppose it is my equivalent of window shopping. I find the feel of beautiful fabrics therapaeutic - more so than even the colour or pattern. I feel rather wonderful after such an outing. I go alone so there is no discussion needed and the lovely people at Fabric Vision - well I guess they know it is all part of the joy and eventually I will buy something. 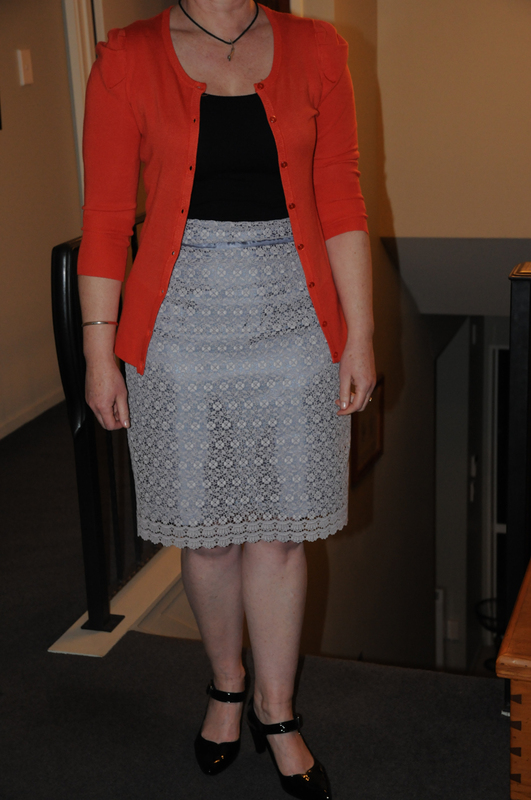 Remember this lovely image - it's actually a burda pattern for the cardi but I loved the lace skirt. So I had my eyes pealed and saw a similar fabric in Spotlight, and grabbed it. It is such a lovely piece of fabric that I was afraid to cut into it and so spent the month of July procrastinating and getting it out and putting it awayt! But yesterday I decided to feel the fear and do it anyway! 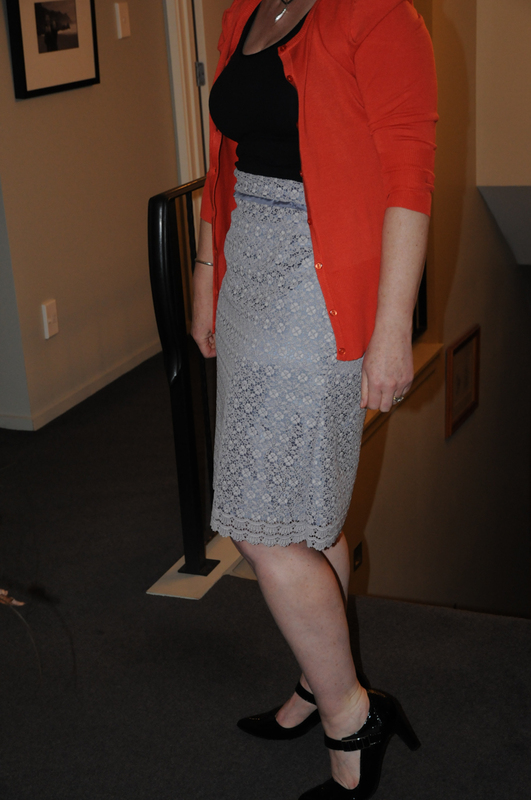 Burda Easy 8155 - it's my third skirt in this pattern and they have all come out quite different! Look - it's turned out just fine. I lined it with grey coloured synthetic fabric so that I was sewing a double layer. 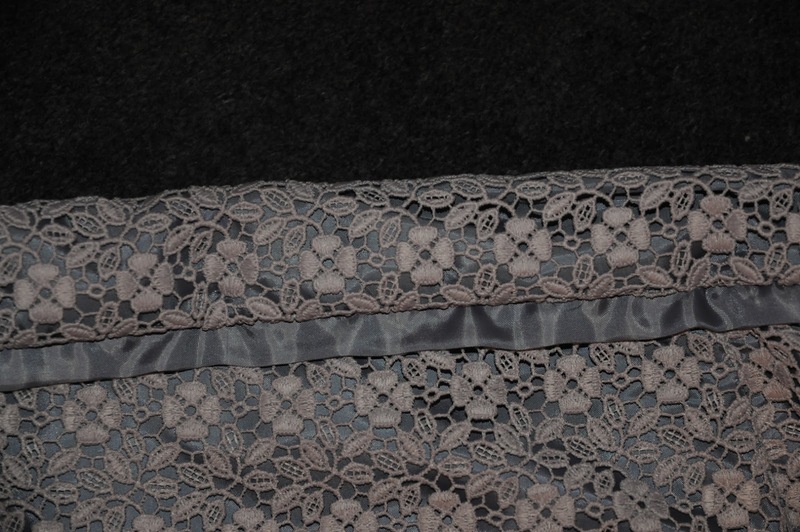 I didn't want the seams to show and the lace was slightly stretchyt and the lining was not! I also decided to do a wee embellishment on the waistband - a grey strip to break it up. Mine rides up a bit more than hers! But love it standing up - I'm imagining myself at a wine and nibbles event where I will be standing and socialising. 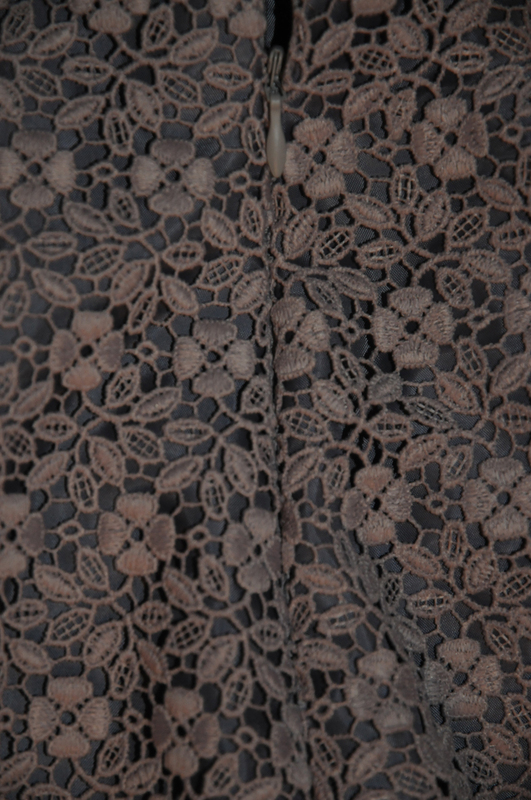 Just note that when I first put the lining in I made it perfectly meeting the bottom of the lace. But when I sast down the lace rode up more and you could see an inch of the lining. So I redid it so that the lining comes to about 1.5 inches above the hem. Lovely scalloped edge which graced the hem. Another invisible, invisible zip - now that I know to unzip the zip iron out the curl I can get it oh so invisible! It's still winter here so I am putting it away so that I have something to wear for when it's gets warmer. Exactly! 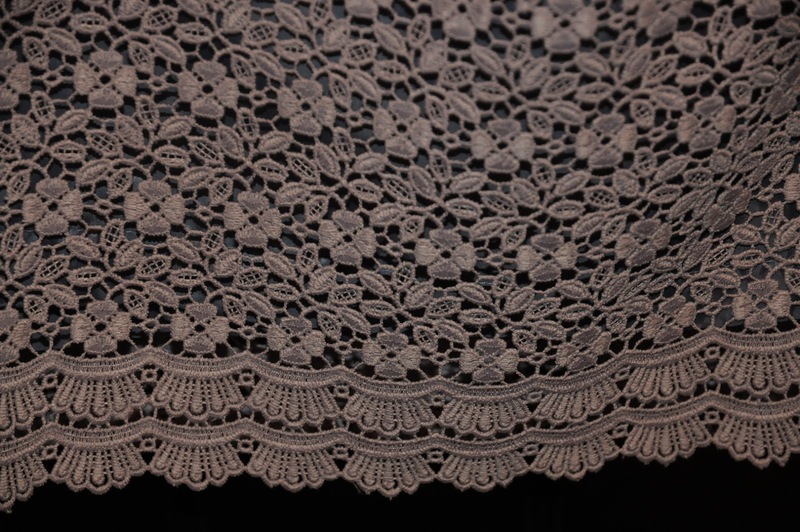 The rest of the lace was not anything special, but then it was $60/metre. I got it in the 30% off sale! Hopefully it will wash up ok since I failed to pre-wash!! That skirt is beautiful-I've seen previews of that burda online but it didn't stand out for me till I saw your make. It actually looks like a lot of different lace ribbons sewn together.. Thank you very much for complimenting my skirt. I'm going to attempt the top cardie - I have a pice on my stash all ready to go. But my light has gone in my machine and it's not the bulb so it will have a visit tot he bernina doctor this week!